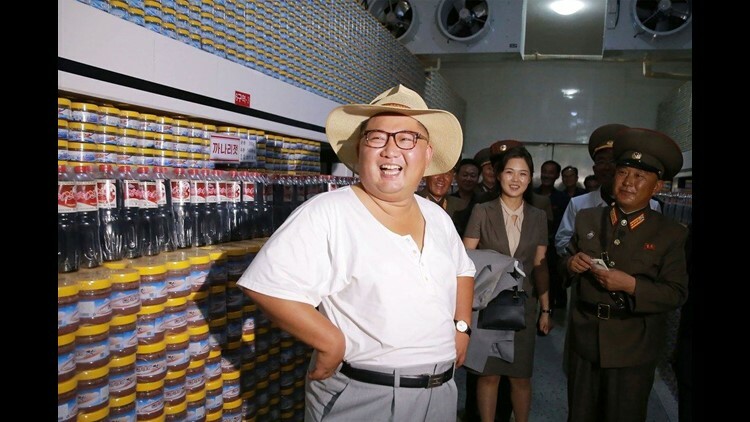 This undated picture released by North Korea's official Korean Central News Agency (KCNA) on August 8, 2018, shows North Korean leader Kim Jong Un inspecting the Kumsanpho Fish Pickling Factory in North Korea. A man waits to cross a street in Rason. at the northeastern tip of North Korea, Nov. 21, 2017. This photo was released by the North Korean Central News Agency on Nov. 30, 2017 of North Korean leader Kim Jong Un giving an order to test-fire the newly developed inter-continental ballistic rocket Hwasong-15 on at an undisclosed location in North Korea. A sailor stands on his boat in the port in Rason at the northeastern tip of North Korea, Nov. 21, 2017. This photo distributed by the North Korean government shows what was is said to be the launch of a Hwasong-14 intercontinental ballistic missile, ICBM, on July 4, 2017. Independent journalists were not given access to cover the event depicted in this photo. Ra In-Hae, 46, in her new home, portraits of late North Korean leaders Kim Il-Sung and Kim Jong-Il, hang on the wall near Rason at the northeastern tip of North Korea, Nov. 21, 2017. A woman shields herself from the cold at the port in Rason at the northeastern tip of North Korea, Nov. 21, 2017. People cheer as they watch the news broadcast announcing North Korean leader Kim Jong Un's order to test-fire the newly developed inter-continental ballistic missile Hwasong-15, Nov. 29, 2017, at the Pyongyang Train Station. Military personnel stand during a rally at Kim Il Sung Square July 2, 2016, in Pyongyang. They were celebrating the new title of chairman of the new State Affairs Commission given to leader Kim Jong Un at a meeting of its national parliament. In this photo provided by South Korea Defense Ministry, bombs dropped by U.S. Air Force B-1B bombers, F-35 stealth fighter jets and South Korean F-15 fighter jets hit a simulated target as they fly over the Korean Peninsula, South Korea, Thursday, Aug. 31, 2017. North Korean soldiers peep into a conference room in the United Nations Command Military Armistice Commission Conference Building during a ceremony marking the 63rd anniversary of the signing of the Korean War ceasefire armistice agreement at the truce village of Panmunjom, South Korea. Vendors prepare flowers for Mother's Day at a flower shop in Pyongyang on Nov. 16, 2017. North Koreans in Pyongyang typically mark Mother's Day with flowers and chocolates. which they celebrate on Nov. 16. In this photo taken through the window of a car, students illuminated by a public television screen walk past the central station in Pyongyang Nov. 16, 2017. People dance in a park in Pyongyang, Nov.15, 2017. This undated picture released from North Korea's official Korean Central News Agency (KCNA) on Nov. 15, 2017 shows North Korean leader Kim Jong-Un inspecting a Kumsong Tractor at the factory in Nampo City, North Korea. These two ride a bicycle as they pass along a street before the city skyline of 'Mirae Scientists Street' in Pyongyang. Sept. 27, 2017. Runners compete in the half-marathon in Pyongyang, Oct. 29, 2017. Amateur horse riders compete during the 'Autumn Race-Goers Games' at the Mirim Riding Club in Pyongyang Oct. 15, 2017. The Mirim riding club equestrian centre opened in 2013 and serves as a destination for foreign tour groups and well-heeled North Koreans. A salesperson of 'Jilin Provincial Muziwu Daily Necessities' of China demonstrates a noodle-making device at the 'Pyongyang International Sci-tech Exhibition', at the Sci-tech Complex in Pyongyang Oct. 16, 2017. Spectators watch competitors during the 'Autumn Race-Goers Games' at the Mirim Riding Club in Pyongyang on Oct. 15, 2017. The Mirim riding club equestrian centre opened in 2013 and serves as a destination for foreign tour groups and well-heeled North Koreans. Men ride on a make shift raft to transport logs down the river that divides North Korea from China near the Chinese city of Lingjiang in northeastern China's Jilin province, Aug. 30, 2017. Participants described as 'working people, youth, and students of Pyongyang' perform during a mass gala event marking the 20th anniversary of late North Korean leader Kim Jong Il's election as general secretary of the Workers' Party of Korea (WPK) on Kim Il-Sung square in central Pyongyang, Oct. 8, 2017. A propaganda troupe perform a flag-waving routine outside the central railway station in Pyongyang, Sept. 2t, 2017. Pedestrians pass through a square outside the central railway station in Pyongyang, Sept. 27, 2017. Visitors try a ride at an amusement fair in Pyongyang, Sept. 26, 2017. Participants of a mass rally shout slogans as they gather on Kim Il-Sung sqaure in Pyongyang on Sept. 23, 2017. Tens of thousands of Pyongyang residents were gathered in the capital's Kim Il-Sung square to laud leader Kim Jong-Un's denunciation of President Donald Trump. A woman carries a child across a road in Pyongyang, Sept. 24, 2017. A Chinese vendor hands scarves to North Korean customers at the 13th International Trade Fair in Pyongyang, Sept. 25, 2017. A woman pulls a trolley across a street before a taxi during rainfall in Pyongyang, Sept. 24, 2017. Two men play pool at a bowling alley in Pyongyang, Sept. 24, 2017. Service persons of the Ministry of People's Security during an anti-US rally in Pyongyang, Sept. 24, 2017. Spectators gather to watch a public news brodcast of a statement by North Korean leader Kim Jong-Un, before a public television screen outside the central railway station in Pyongyang, Sept. 21, 2017. Dancers perform during the 20th ITF World Taekwondo Championships in Pyongyang, Sept. 21, 2017. A woman stands at a street-side flower stall in Pyongyang, Sept. 21, 2017. A woman stops by a kiosk selling gifts and flowers along the streets of Pyongyang, June 16, 2017. A man crosses a street outside the central railway station in Pyongyang, Sept. 21, 2017. A girl leans on a lamp post outside the central railway station in Pyongyang, Sept. 21, 2017. Spectators listen to a television news brodcast of a statment by North Korean leader Kim Jong-Un, before a public television screen outside the central railway station in Pyongyang on Sept. 21, 2017. The skyline of Pyongyang, Sept. 20, 2017. This undated picture released from North Korea's official Korean Central News Agency (KCNA) on Sept. 21, 2017 shows North Korean leader Kim Jong-Un visiting a fruit farm in the South Hwanghae Province. A group of North Korean tourists stand before the city skyline atop the Juche tower in Pyongyang Sept. 20, 2017. A North Korean soldier stands on the bank of the Yalu river near the North Korean town of Sinuiju, opposite the Chinese border city of Dandong, in China's northeast Liaoning province on Sept. 4, 2017. Fireworks go off while Pyongyang residents and military people hold a celebration rally on the test of a hydrogen bomb for ICBM at Kim Il Sung Square in Pyongyang, Sept. 4, 2017. Korean People's Army (KPA) soldiers cheer while watching fireworks during a mass celebration in Pyongyang for scientists involved in carrying out North Korea's largest nuclear blast to date.Sept. 6, 2017. Citizens of the capital lined the streets to wave pink and purple pom-poms and cheer a convoy of buses carrying the specialists into the city, and toss confetti over them as they walked into Kim Il-Sung Square. Korean People's Army (KPA) soldiers attend a mass celebration in Pyongyang for scientists involved in carrying out North Korea's largest nuclear blast to date, Sept. 6, 2017. The sun rises over North Korea and the Yalu river which forms the border between China and North Korea, as seen from Dandong, in China's northeast Liaoning province on Sept. 5, 2017. North Koreand rest on a wall on the bank of the Yalu river near the North Korean town of Sinuiju, opposite the Chinese border city of Dandong, in China's northeast Liaoning province on Sept. 5, 2017. North Korean soldiers stand at a fence on the bank of the Yalu river near the North Korean town of Sinuiju, opposite the Chinese border city of Dandong, in China's northeast Liaoning province on Sept. 5, 2017. The North Korean coastline can be seen behind the barbed-wire fence of the Demilitarized zone (DMZ) separating North and South Korea, on Ganghwa island Sept. 4, 2017. Two North Koreans help each other wash in the Yalu river near the North Korean town of Sinuiju, opposite the Chinese border city of Dandong, in China's northeast Liaoning province on Sept. 4, 2017. A North Korean man brings his boat up to a Chinese tourist boat to sell North Korean products, on the Yalu river near the North Korean town of Sinuiju, opposite the Chinese border city of Dandong, in China's northeast Liaoning province on Sept. 4, 2017. North Korean men unload a trailer on the bank of the Yalu river near the North Korean town of Sinuiju, opposite the Chinese border city of Dandong, in China's northeast Liaoning province on Sept. 4, 2017. A North Korean soldier stands on a loading ramp on the bank of the Yalu river near the North Korean town of Sinuiju, opposite the Chinese border city of Dandong, in China's northeast Liaoning province on Sept. 4, 2017. Korean People's Army soldiers applaud as they watch a screen showing news coverage of a missile test launch, in a public square outside a train station in Pyongyang on Aug 30, 2017. People fill the square of the main railway station to watch a televised news broadcast of the test-fire of an inter-continental ballistic rocket Hwasong-12, in Pyongyang, Aug. 30, 2017. This picture from North Korea's official Korean Central News Agency (KCNA) taken on Aug. 29, 2017 and released on Aug. 30, 2017 shows North Korea's intermediate-range strategic ballistic rocket Hwasong-12 lifting off from the launching pad at an undisclosed location near Pyongyang. Cashiers work at the Potonggang department store in Pyongyang, North Korea, June 19, 2017. People wave banners and shout slogans as they attend a rally in support of North Korea's stance against the US, on Kim Il-Sung square in Pyongyang on Aug. 9, 2017. Pedestrians and vehicles pass before the portraits of late North Korean leaders Kim Il-Sung (L) and Kim Jong-Il (R) in Pyongyang on July 21, 2017. Awoman stands at the entrance to a supermarket in Pyongyang on July 28, 2017. Steel worker Kang Chol-Su (38) poses for a portrait at the Chollima Steel Complex, south of Pyongyang on July 22, 2017. A hostess cooks clams using gasoline, at the West Sea Barrage beach outside the coastal city of Nampho, southwest of Pyongyang on July 22, 2017. The West Sea Barrage beach features as a stopping point for foreign tourists, and is a destination for North Korean work groups from the neighbouring area. The beach lies at the end of an eight-kilometre-long barrage that separates the sea from the Taedong River, which runs through Pyongyang. Swimmers gather in a wave pool at a water park in a leisure complex in Pyongyang on July 21, 2017. A group of men look towards the West Sea Barrage beach outside the coastal city of Nampo, southwest of Pyongyang, July 22, 2017. The West Sea Barrage beach features as a stopping point for foreign tourists, and is a destination for North Korean work groups from the neighboring area. The beach lies at the end of a long barrage that separates the sea from the Taedong River, which runs through Pyongyang. Workers repair a section of the 'West Sea Barrage' outside the coastal city of Nampo, southwest of Pyongyang, July 22, 2017. The North Korea's women soccer team fills up custom forms in front of a globe structure as they prepare for departure to Beijing at Pyongyang's International Airport Feb. 23, 2016. A group of youths play tennis in a public square in Pyongyang on July 20, 2017. Korean People's Army (KPA) soldiers walk past portraits of late North Korean leaders Kim Il-Sung (L) and Kim Jong-Il (R) at the Korean Revolutionary Museum in Pyongyang on July 19, 2017. A North Korean traffic police woman directs vehicles at an intersection, Tuesday, Sept. 15, 2015, in Pyongyang, North Korea, as residents commute at the end of the work day. Men transport gas cylinders in Pyongyang, Feb. 13, 2017. Soldiers of the Korean People's Army (KPA) watch a fireworks display as part of celebrations marking the July 4 launch of the Hwasong-14 intercontinental ballistic missile, in Pyongyang, July 6, 2017. A primary school student An Jae-Gwon (10) poses for a portrait during a festive 'children's day' event at 'Primary School Number 4' in Pyongyang, June 6, 2017. Staff members from a boat restaurant on the Taedong River line up at the entrance as they wait to greet customers June 18, 2017, in Pyongyang. The boat is berthed along the river, which is the fifth longest river on the Korean Peninsula and runs through the country's capital. A Korean People's Army (KPA) soldier gestures as he stands before the military demarcation line separating North and South Korea, before South Korea's 'Freedom House' (rear C) at the Joint Security Area (JSA) near Kaesong, June 4, 2017. Men push their bicycles past the portraits of late North Korean leaders Kim Il-Sungand Kim Jong-Il on Kim Il-Sung square in Pyongyang, June 4, 2017. North Korean leader Kim Jong-Un at a photo session with the participants in the 8th Congress of the Korean Children's Union in Pyongyang, June 6, 2017. Former NBA basketball player Dennis Rodman arrives at Sunan International Airport June 13, 2017, in Pyongyang. People watch a screen showing news coverage of the Pukguksong-2 missile rocket launch at a public square in central Pyongyang May 22, 2017. A fighter jet is installed as a monument near the town of Hwacheon, May 21, 2017. This undated picture released from North Korea's official Korean Central News Agency (KCNA) on May 22, 2017 shows North Korean ground-to-ground medium-to-long range strategic ballistic missile Pukguksong-2 being launched in a test-fire. North Korea declared its medium-range Pukguksong-2 missile ready for deployment after a weekend test, the latest step in its quest to defy UN sanctions and develop a weapon capable of striking US targets. Schoolgirls attend a dance class at the Mangyongdae Children's Palace in Pyongyang, April 14, 2017. Amid rising regional tensions, Pyongyang residents have been preparing for North Korea's most important holiday: the 105th birth anniversary of Kim Il Sung, the country's late founder and grandfather of current ruler Kim Jong Un. Soldiers march across Kim Il Sung Square during a military parade on in Pyongyang, April 15, 2017, They were celebrating the 105th birth anniversary of Kim Il Sung, the country's late founder and grandfather of current ruler Kim Jong Un. Commuters walk up the stairs as a train leaves a subway station in Pyongyang April 14, 2017. A North Korean soldier uses his binoculars on the banks of the Yalu river near Sinuiju, opposite the Chinese border city of Dandong April 14, 2017. A commuter is seen through a tram window in Pyongyang April 14, 2017. A boy performs the zither at the Mangyondae School Children's Palace in Pyongyang, April 14, 2017. Students participate in a mass dance event to mark the occasion of the late North Korean leader Kim Jong Il's election as chairman of the National Defense Committee in 1993, in Pyongyang on April 9, 2017. Mass dances are usually held to mark important dates and national holidays in the North Korean capital. Competitors run through Kim Il-Sung square during the Pyongyang Marathon April 9, 2017. The newly renovated Koryo hotel main lobby in Pyongyang on April 10, 2017. A North Korean soldier looks at the south side while U.S. Secretary of State Rex Tillerson was visiting the border village of Panmunjom, which has separated the two Koreas since the Korean War, March 17, 2017. Kim Jong-Un visits a construction site in Pyongyang, March 16, 2017. A North Korean soldier takes a photograph while two South Korean soldiers stand guard March 17, 2017. People ski at the Masik Pass Ski Resort in Wonsan, Feb. 11, 2017. People watch news footage of a missile launch on a giant television screen outside the main railway station in Pyongyang March 7, 2017. This undated picture released by North Korea's Korean Central News Agency on March 7, 2017 shows the launch of four ballistic missiles by the Korean People's Army during a military drill at an undisclosed location in North Korea. Kim Jong-Un supervives the launching of four ballistic missiles by the Korean People's Army during a military drill at an undisclosed location in North Korea. This photo was released by North Korea's Korean Central News Agency (KCNA) via on March 7, 2017. The representatives of diplomatic missions and international organizations plant memorial trees in downtown Pyongyang March 2, 2017. Pyongyang's new "Ryomyong Street" is to have the country's tallest apartment building, at 70 stories, along with a 50-story building and a handful of smaller ones in the 30-40 story range. A security guard stands in a courtyard of the Kim Jong-Suk textile mill following a snowfall in Pyongyang, Feb. 22, 2017. Two women walk outside a dormitory of the Kim Jong-Suk textile mill in Pyongyang Feb. 22, 2017. A worker pushes a trolley carrying buckets of silk-worm larvae at the Kim Jong Suk Silk Mill in Pyongyang Feb. 21, 2017. The Kim Jong Suk Silk Mill employs a workforce of 1,600 people, and is named after the grandmother of current North Korean leader Kim Jong-Un. People watch a fireworks display as they visit an ice festival near the Taedong river, on the occasion of the 75th anniversary of the birth of Kim Jong-Il, in central Pyongyang Feb. 16, 2017. People look at a noticeboard after a fireworks display in front of Kim Il-Sung square as they visit an ice festival near the Taedong river, on the occasion of the 75th anniversary of the birth of Kim Jong-Il, in central Pyongyang, Feb. 16, 2017. A woman dressed in a traditional gown pays her respects at statues of late North Korean leaders, Kim Il Sung, left, and Kim Jong Il, in Pyongyang, North Korea, Thursday, Feb. 16, 2017. Unaware of reports his eldest son - and current leader Kim Jong Uns half-brother - was killed just days ago in what appears to have been a carefully planned assassination, North Koreans marked the birthday of late leader Kim Jong Il on Thursday as they do every year. Performers take part in a mass dance event on the occasion of the 75th anniversary of the birth of Kim Jong-Il, in Pyongyang on Feb. 16, 2017. North Korean leader Kim Jong-Un visits the newly built Pyongyang Orphans' Primary School, Feb. 2, 2017. Children of the workers at the Suk Silk Mill sing and dance at a childcare center at the the mill in Pyongyang, Jan. 6, 2017. The mill, named after North Korean leader Kim Jong UnÕs grandmother, is where 1,600 workers _ mostly women _ sort and process silkworms which produce silk thread that officials at the Pyongyang factory say is made into roughly 200 tons of silk a year. Kim Jong-Un posing with the school students while visiting newly built Pyongyang Orphans' Primary School, Feb. 2, 2017. A traffic police officer directs traffic on a road in Pyongyang Dec. 2, 2016 Believed to be hand-picked for their looks, Pyongyang's female traffic police are a familiar sight at intersections around the capital, where traffic volumes have noticeably increased in recent years. North Korean honor guards watch as Choe Ryong Hae, vice chairman of North Korea's State Affairs Commission leaves for the departure gates at the Pyongyang Airport Jan. 6, 2017. Hae was headed to Nicaragua to attend the inauguration of their newly elected President Daniel Ortega. Kim Jong-Un at Fishery Station No. 15 of the Korean People's Army unit 549 Dec. 15, 2016. Baek Hyun-kyung is a tour guide at the Three Charters of National Reunification Monument where she works on the outskirts of Pyongyang Dec. 2, 2016. A member of North Korea's under-20 women's football team is welcomed back at Pyongyang airport after beating France to win the 2016 FIFA under-20 Women's World Cup Dec. 6, 2016. Kim Jong-Un at the Wonsan Shoes Factory in Kangwon Province in this photo released on Dec. 9, 2016. Korean People's Army (KPA) lieutenant and tour guide Hwang Myong-jin poses for a photo in front of a hut where negotiations for the Korean War armistice agreement were held in 1953, at Panmunjom near the Demilitarized Zone (DMZ) separating North and South Korea Nov. 30, 2016. Sailor Kim Il-Soo poses for a photo on a boat used to host wedding photo shoots on the Taedong river in Pyongyang Nov. 25, 2016. Kim Jong-Un interacting with people while inspecting the outpost on Kali Islet and the defence detachment on Jangjae Islet in the West Sea, Nov. 13, 2016. Azalea, whose Korean name is "Dalle", a 19-year-old female chimpanzee, smokes a cigarette at the Central Zoo in Pyongyang, North Korea Oct. 19, 2016. According to officials at the newly renovated zoo, which has become a favorite leisure spot in the North Korean capital since it was re-opened in July, the chimpanzee smokes about a pack a day. They insist, however, that she does not inhale. Students stretch following an under-14 training session at the Pyongyang International Football School in Pyongyang, Sept 22, 2016. Spectators cheer as parachutists perform an aerial display during the Wonsan International Friendship Air Festival, Sept 24, 2016. North Korean female MiG-21 fighter pilots Rim Sol, left, and Jo Kum Hyang, right, walk past a MiG-21 plane at the Wonsan International Friendship Air Festival, Sept 24, 2016. Residents look up at a big screen TV in front of Pyongyang railway station showing television presenter Ri Chun-Hee officially announcing that the country successfully tested a nuclear warhead earlier in the day on Sept. 9, 2016. North Korea has successfully tested a nuclear warhead, it said which said the "maniacal recklessness" of young ruler Kim Jong-Un would lead to self-destruction. This is a national meeting to celebrate the 68th founding anniversary of the Democratic People's Republic of Korea (DPRK) in Pyongyang, Sept. 9, 2016. A North Korean man gulps down a glass of draft beer during a beer drinking competition held Aug. 12, 2016 in Pyongyang. This competition was held during a beer festival along the Taedong River in the North Korean capital. North Korean leader Kim Jong-Un inspects the Chollima building materials complex in Pyongyang, July 27, 2016. 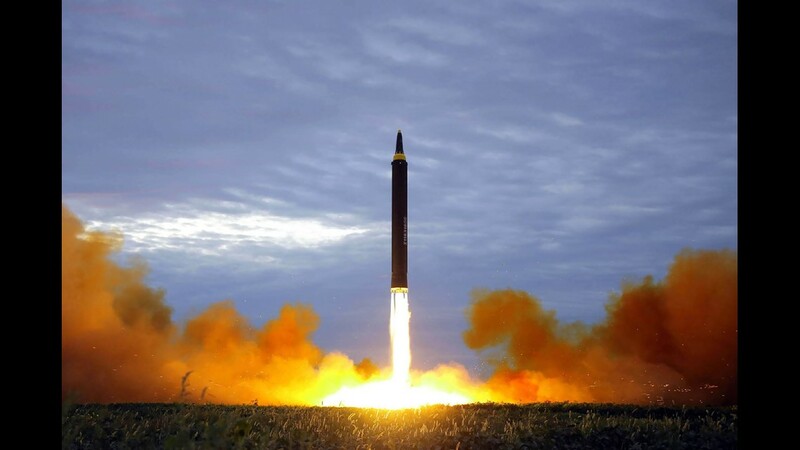 A surface-to-surface medium long-range strategic ballistic rocket Hwasong-10, also known by the name of Musudan missile, being launched at an undisclosed location, North Korea. According to South Korea and Japan's officials, North Korea test-fired a ballistic missile off its east coast early Aug 3, 2016. A missile is fired during a drill by Hwasong artillery units of the Strategic Force of the Korean People's Army, photo released on July 21, 2016 . North Korea said its latest ballistic missile tests trialled detonation devices for possible nuclear strikes on US targets in South Korea and were personally monitored by supreme leader Kim Jong-Un. Fairground participants ride a big swing in Pyongyang July 9, 2016. Performers meet North Korean leader Kim Jong-Un at an art performance staged by the amateur art groups of the Korean People's Army (KPA) units in Pyongyang July 16, 2016. A traffic police woman directs vehicles at a street junction in front of a sidewalk decorated with flags of the ruling party, the Workers' Party in Pyongyang, May, 5, 2016. North Koreans push their bicycles in the rain on a pathway along the Pothong River in Pyongyang. People walk on a rail tracks in Pyongyang, April 18, 2016. People ride the escalators at the Puhung metro station in Pyongyang, April 16, 2016. A woman carries a bag next to a board in Pyongyang suburbs April 17, 2016. City view of Pyongyang, April 17, 2016. A metro employee on board the newest cars at the Puhung metro station in Pyongyang, April, 13, 2016. They have one of the deepest metros in the world consisting of two lines with these recently added new cars. A live-shell firing drill by artillery sub-units under large combined units of the North Korean Army, is shown in this undated photo, under the simulated conditions of beating back enemy forces conducting a surprise night landing. The photo was released by North Korea's official Korean Central News Agency (KCNA) on April 12, 2016. Kim Jong Un, left, Supreme Commander of the Korean People's Army, issues an order to conduct the ground jet test of a new type high-power engine of inter-continental ballistic rocket and comes to the Sohae Space Center to guide the test. A rocket is displayed during the Immortal Flower Festival 'Kimilsungia' in Pyongyang, North Korea on April 13, 2016. The country is preparing to mark the 'Day of the Sun' celebrating the day of birth of the country's founder, Kim Il-Sung. on April 15. Young women participate in a rehearsal ahead of the 'Day of the Sun' celebrations at Kim Il Sung Square on Wednesday, in Pyongyang. This is a view of the Pyongyang, North Korea skyline on April 12, 2016. An image of the operation of a new type large-caliber multiple rocket launching system at an undisclosed location in North Korea is released from KCNA on March 24, 2016. North Korean leader Kim Jong-Un has claimed an "historic" advance in the country's nuclear strike capability with the successful test of a solid-fuel rocket engine, state media said. A man cycles past the Kim Il Sung square on Wednesday, ahead of the 'Day of the Sun' celebrations in Pyongyang, North Korea. Young boys get the view of Pyongyang, North Korea from a bus window, April 12. A worker unloads a bag of fertilizer from a conveyer belt at Hungnam Fertilizer Complex in Hungnam, South Hamgyong Province, North Korea, March 13, 2016. A North Korean soldier walks past a truck near goods piled up on a dockyard in Sinuiju, North Korea, March 14, 2016. This undated photo released by North Korea's official Korean Central News Agency (KCNA) on April 2, 2016 shows a missile test of a new-type anti-air guided weapon system at an unknown location. Kim Jong-Un inspecting the test of a new-type anti-air guided weapon system at an unknown location. photo released on April 2, 2016. North Korean leader Kim Jong-Un inspecting the Plant under the Ryongsong Machine Complex in North Korea. A woman cycles with her child riding in a basket in Kaesong, Feb. 22, 2016. Korean People's Army Lt. Col. Nam Dong Ho is silhouetted against the truce village of Panmunjom at the Demilitarized Zone Feb. 22, 2016. North Korean leader Kim Jong-Un attends a concert marking the 70th founding anniversary of the KPA military band in Pyongyang, in this photo released Feb, 23, 2016. A boy pushes a cart of cabbage along a main road in Hyangsan County, north of Pyongyang, Dec. 3, 2015. South Korean army soldiers close a gate in Paju, near the border with North and South Korea, Feb. 8, 2016. People ride in a boat in the Yalu River near Dandong, Feb. 9, 2016. North Korean soldiers patrol next to the border fence near the town of Sinuiju, Feb. 10, 2016. A man works on a boat on the banks of the Yalu River Feb. 10, 2016. The sun rises over the bridge on the banks of the Yalu River in the Chinese border town of Dandong opposite to the North Korean town of Sinuiju Feb.10, 2016. A man rides his bicycle in front of a portion of the Great Wall on Hwanggumpyong Island, located in the middle of the Yalu River between the North Korean town of Sinuiju and the Chinese town of Dandong Feb. 9, 2016. A man and his son on a boat on of the Yalu River at the town of Sinuiju across from the Chinese border town of Dandong Feb. 9, 2016. People and a truck embark a boat on the Yalu River near the town of Sinuiju across from the Chinese border town of Dandong Feb. 9, 2016. North Korean soldiers on the banks of the Yalu River at the town of Sinuiju, Feb. 8, 2016. North Korean soldiers stand at their watchtower as another walks on the banks of the Yalu River in the town of Sinuiju Feb. 8, 2016. A North Korean soldier smokes a cigarette on the banks of the Yalu River in the North Korean town of Sinuiju, in an image taken from across the river in the Chinese border town of Dandong Feb. 8, 2016. North Korean military personnel celebrate after North Korea said it had conducted a hydrogen bomb test, at the Kim Il Sung Square in Pyongyang, Jan. 8, 2016. A pair of North Korean soldiers walk through a field in Sakchu county, North Korea, Jan. 7, 2016. North Korean veterans gather before the start of a parade in Pyongyang, North Korea. Leader Kim Jong Un declared that his country was ready to stand up to any threat posed by the United States as he spoke at a lavish military parade to mark the 70th anniversary of the North's ruling party and trumpet his third-generation leadership, Oct. 10, 2015. A barbed wire fence at a military check point near the demilitarized zone which separates South and North Korea on Jan. 6, 2016 in Paju, South Korea. North Korea's leader Kim Jong-un watches a military firing contest in the photo released Jan, 5, 2016. Reports did not specify when Kim viewed the contest, but it is presumed to be his first military-related field guidance of 2016. Hyeon Soo Lim who pastors the Light Korean Presbyterian Church in Toronto, is escorted to his sentencing in Pyongyang, North Korea, Dec. 16, 2015. North Korea's Supreme Court sentenced him to life in prison with hard labor for what it called crimes against the state. North Korean leader Kim Jong-Un accompanied by commanding officers of the Korean People's Army visit the Kumsusan Palace where his father Kim Jong-Il lies, Dec 17, 2015. A picture made available on October 25, 2015 shows a general view of Mount Kumgang covered in fog, on North Korea's east coast. This picture released from North Korea's official Korean Central News Agency on November 8, 2015 shows Kim Jong-Un attending a photo session with military education officers. This undated picture released from North Korea's official Korean Central News Agency (KCNA) on September 14, 2015, shows North Korean leader Kim Jong-Un inspecting the construction site of the Paektusan Hero Youth power station in Ryanggaung province. A picture released by the Rodong Sinmun, the newspaper of the ruling North Korean Workers Party, on September 8, 2015 shows North Korean leader Kim Jong-un (C, front) and Miguel Diaz-Canel Bermudez (2-R, front row), a member of the Political Bureau of the Central Committee of the Communist Party of Cuba and first vice-president of the Council of State, watching an art performance by the Moranbong Band and the State Merited Chorus in Pyongyang, North Korea, on September 7, 2015. Bermudez led a Cuban delegation to North Korea to mark the 55th anniversary of the establishment of diplomatic relations between North Korea and Cuba. This undated photo released by North Korea's official Korean Central News Agency (KCNA) on September 5, 2015 shows North Korean leader Kim Jong-Un (C) at the Sinuiju Measuring Instrument Factory in North Pyongan Provice. In this Sunday, Aug. 23, 2015 photo, North Koreans read the public copy of a daily newspaper on the platform of a subway station in Pyongyang, North Kroea. This undated picture released from North Korea's official Korean Central News Agency (KCNA) on August 18, 2015 shows North Korean leader Kim Jong-Un (2nd L) visiting the Taedonggang Combined Fruit Farm in Pyongyang. In this Aug. 16, 2015 photo, people queue up at kiosk in Pyongyang, North Korea. Street stalls that offer North Koreans a place to spend - or make - money on everything from snow cones to DVDs are flourishing in Pyongyang and other North Korean cities, modest but growing forms of private commerce in a country where capitalism is officially anathema. People dance during the celebration of the Liberation Day as the portrait of North Korean leaders Kim Il Sung, left, and Kim Jong Il are seen in the background at Kim Il Sung Square in Pyongyang, North Korea, Saturday, Aug. 15, 2015. Thousands of people take part in the celebration that commemorates the 17th anniversary of the liberation of the Koreas from Japanese colonial rule. North Korean soldiers watch as fireworks explode, Monday, July 27, 2015, in Pyongyang, North Korea as part of celebrations for the 62nd anniversary of the armistice that ended the Korean War. Staff wait at the check-in counters of the new international airport terminal building at Pyongyang airport, Wednesday, July 1, 2015, in Pyongyang, North Korea. The unveiling underscores an effort to attract more tourists and to spruce up the country ahead of the celebration of a major anniversary of the founding of its ruling Worker's Party in October this year. In this Saturday, June 27, 2015, photo, an Air Koryo plane sits on the tarmac in front of the new Pyongyang International Airport terminal building, in Pyongyang, North Korea. Air Koryo is the only carrier to have been awarded just one star in rankings released recently by the UK-based SkyTrax consultancy agency. Men and women pump their fists in the air and chant "Defend!" as they carry propaganda slogans calling for reunification of their country during the "Pyongyang Mass Rally on the Day of the Struggle Against the U.S.," attended by approximately 100,000 North Koreans to mark the 65th anniversary of the outbreak of the Korean War at the Kim Il Sung stadium, Thursday, June 25, 2015, in Pyongyang, North Korea. The month of June in North Korea is known as the "Struggle Against U.S. Imperialism Month" and it's a time for North Koreans to swarm to war museums, mobilize for gatherings denouncing the evils of the United States and join in a general, nationwide whipping up of the anti-American sentiment. In this June 24, 2015, photo, a farmer stands in front of a field in South Hwanghae, North Korea. There has been almost no rain in this part of the country, according to farmers and local officials interviewed by The Associated Press. While the situation in the area that the AP visited looks grim, it is unclear how severe the drought is in the rest of the country. North Korean leader Kim Jong-Un, center, visits the Kumsusan Palace of the Sun on April 15 to celebrate the 103rd birthday of his grandfather, the late president Kim Il-Sung, in Pyongyang. A national meeting is held on April 14 at the Pyongyang Indoor Stadium. North Korean leader Kim Jong-Un, center, inspecting Unit 1016 of Korean People's Army Air and Anti-Air Force on March 10. North Korean workers plant seedlings in a field on Feb. 3 in Jaeryong, Hwanghae province. A state photo from December 5 shows North Korean leader Kim Jong-un observing the North Korean military's winter training at an unknown location in North Korea. This handout picture released from North Korea's official Korean Central News Agency on December 9, 2014 shows North Korean leader Kim Jong-Un holding up a boy as he joins a photo session with the participants in the second meeting of Korean People's Army exemplary servicemen's families in Pyongyang. Jang Song-thaek is escorted in court on December 12, 2013. North Korea has executed him, the uncle of its leader Kim Jong Un, after a shock purge, state news agency KCNA announced early on Dec. 13, branding the once-powerful man a "traitor." A man watches a TV news program being shown at a railway station in Seoul. The report shows North Korean leader Kim Jong Un's uncle, Jang Song Thaek, second from right, being escorted by military officers during a trial in Pyongyang, North Korea, on Thursday, Dec. 12, 2013. At dusk, the setting sunlight is reflected on the Taedong River in Pyongyang, North Korea on July 21, 2013. North Korean nurses sing and play the accordion while children dance during an event to start a campaign to give Vitamin A supplements and deworming pills to children at a nursery school in Pyongyang, North Korea, on Child Health Day, Monday, May 20, 2013. UNICEF and North Korean government agencies are collaborating in the campaign to assist 1.7 million children across the country under the age of five. North Korean nurses give Vitamin A supplements and deworming pills to children dressed in their best outfits at an elite nursery school in Pyongyang, North Korea. North Koreans pass by the outer wall of a construction site where a propaganda billboard depicts the launch of North Korean rockets in Pyongyang, North Korea. The billboard reads: "Lets open up an era to a strong economic country." North Koreans play a board game inside a sauna at the Haedanghwa Health Complex in Pyongyang, North Korea, Sunday, May 19, 2013. The newly opened complex houses a cooking school, multiple banquet rooms, swimming and wading pools, a billiards room and other spa and recreational facilities. North Korean swimmers enter a waterfall wading pool inside the Haedanghwa Health Complex in Pyongyang, North Korea. Wearing gym-provided workout clothing, North Koreans rest near the gym at the Haedanghwa Health Complex in Pyongyang, North Korea. Portraits of the late North Korean leaders Kim Il Sung, left, and Kim Jong Il hang on the outside of a building in central Pyongyang, North Korea, on Saturday, May 18, 2013. A North Korean traffic policeman stands at an intersection in Kaesong, North Korea on April 23.